The PlayStation Blog earlier today was all about indie projects for Sony platforms, highlighting four games that, for different reasons, all look great. First up is Vita (and mobile) strategy game Rymdkapsel, which strips just about everything away from the RTS genre except coloured planes and mechanics. It's out today. Next is Hohokum for the PS4, PS3 and Vita (pictured above), which is out in 2014. 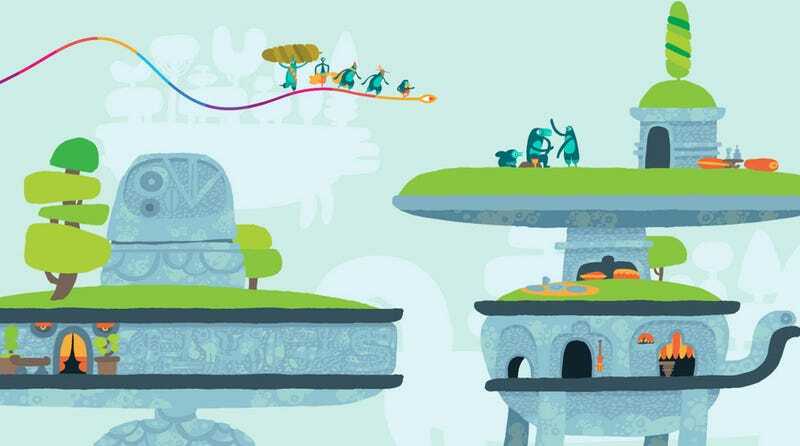 You play a snake/kite/thing, and the collaboration with artist Richard Hogg looks gorgeous. Third is CounterSpy, for the PS3 and Vita. A side-scroller, it's got a vintage art style and side-scrolling action. The last one is Doki-Doki Universe, a...strange series of titles from Greg Johnson, the creator of Toejam & Earl. It's for PS4, PS3 and Vita. While each game looks interesting in its own right, it's also great to see that each is coming to the Vita. Which may give me reason to stop calling it my "thing that only plays Persona 4".